"What is the best and easiest way to compress a BD50 movie to BD25 disc? Main Movie and sound only. I used to use DVDShrink to take out the extra features and such on DVD’s, is there any great program to help copy BD50 to BD25 disc without quality loss?" Questions like the one mentioned above are now flooding the internet. Since many of you guys are having a hair-pulling experience on shrinking BD50 to BD25 disc, so right here we share 2 best Blu-ray copy software to help you out – Leawo Blu-ray Copy and DVDFab Blu-ray Copy. Below we provide an overview for each of the 2 best Blu-ray copy software. After better knowing what they work as, just choose the one you like to copy BD50 to BD25 disc easily. BD25 and BD50 stand for the capacity of the data that each disc can hold. A normal blu-ray will hold 25 Gigabytes of data, while a dual-layered one (BD50) will hold 50 gigs, double the amount. There is no Blu-ray shrink softwares that can complete shrink BD50 to BD25 with no quality loss. The sound files in Bluray movies (Dolby True HD, Dolby digital, DTS HD, DTS, etc.) couldn’t be compressed because of their authorized structure. To shrink BD50 to BD25, it is highly recommended to keep the main movie with 1 language and 1 subtitle only and get the best quality for that. Blu-ray recorder drive: To directly shrink BD50 to BD25, you need to install 2 Blu-ray recorder drives onto your computer, one for inserting source BD50 disc and the other for inserting target BD25 disc. You could also get only one Blu-ray recorder drive to firstly copy BD50 disc onto computer in BD25 format and then backup the copied BD50 disc content from computer to BD25 disc. Blu-ray shrink software: A Blu-ray shrink or Blu-ray copy software program is a must have for copying BD50 to BD25. Source BD50 disc and blank writable BD25 disc: Get source BD50 disc and target blank writable BD25 disc ready for shrinking. Internet connection: Some Blu-ray shrink software requires Internet connection for disc protection and region code restriction removing. Enough hard drive space: For saving BD50 disc onto computer hard drive before copying to BD25 disc, you need to get enough hard drive space on your computer. Leawo Blu-ray Copy is one of the best Blu-ray copy software. Its richest functionalities and excellent performances win it the title of “the most powerful all-in-one Blu-ray copy software”. Perfectly rolling Blu-ray Decrypter, Blu-ray Copy, Blu-ray Cloner and ISO Image Burner into one, the program does its job quite well: copy Blu-ray/DVD in disc, folder or ISO Image File to computer hard drive or blank disc; remove Blu-ray/DVD disc protections; 1:1 disc to disc duplication with zero quality loss; compress BD50 to BD25 or DVD-9 to DVD-5 with high quality; provide multiple movie copy modes for multiple uses, including movie-only and full-movie backup; copy 3D Blu-ray disc with 3D effect retained. Leawo Blu-ray Copy is available in both Win and Mac versions. So if you run on a Mac, you can turn to Leawo Blu-ray Copy for Mac. 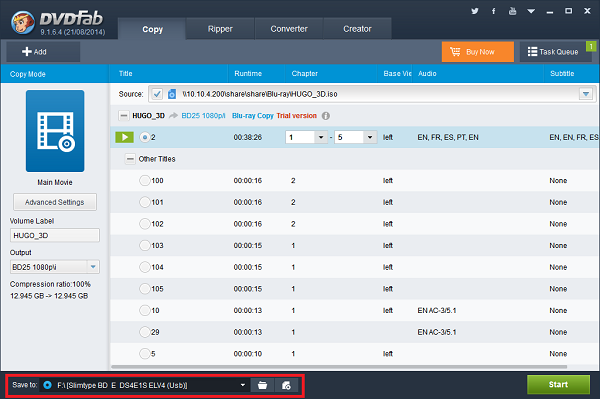 Download and install Leawo Blu-ray Copy on your computer, then follow the below guide to learn how to copy Blu-ray disc from BD50 to BD25. Insert BD50 disc into the Blu-ray recorder drive and then launch Leawo Blu-ray Copy. Click the “Add Blu-ray/DVD” button to import source BD50 movies from disc drive, or browse BD50 movie from your computer. After loading source BD50 disc, you could actually do a lot, like playing back loaded titles. At the bottom left corner, select a copy mode from "Full Movie", "Main Movie" and "Custom Mode" (Main Movie is recommended for copying BD50 to BD25). Also, set output disc type as BD-25. Click the big green “Copy” button. On the popup sidebar, set “Copy to”, “Disc Label” and “Save to” option. If you get 2 Blu-ray recorder drives, you could insert target BD25 disc into the other blank Blu-ray recorder drive and then select it as target in "Copy to" option. If you only get one Blu-ray recorder drive, choose to copy BD50 to ISO image file first. Click “Copy” button on the right sidebar to shrink BD50 to BD25. If your computer has 2 Blu-ray recorder drives, Leawo Blu-ray Copy would help you directly shrink BD50 to BD25. If you choose to copy BD50 to ISO image file first, you could continue to follow the below 2 steps to learn how to copy shrinked BD50 ISO image file onto BD25 disc. After copying BD50 to BD25 ISO image file, you could use Leawo Blu-ray Copy to transfer the created BD25 ISO image file onto a blank BD25 disc easily. Insert a blank writable BD25 disc into the Blu-ray recorder drive. Directly drag and drop created BD25 ISO image file from the directory you’ve set in “Save to” option in Step 3 (or click the drop-down arrow box next to the “Add Blu-ray/DVD” button and then select “Add iso file” to add created ISO file). On the popup “Add iso file” window, set Copy to and Disc Label options. Click the “Burn” button to start burning BD25 ISO image file to BD25 disc to complete BD50 to BD25 shrinking. DVDFab Blu-ray Copy has great reputation among Blu-ray fans. The program gets Blu-ray Copy, Burner, Cloner and Decrypter into perfect combination. It could remove all known copy protections including the newest MKB and bus encryption, BD-Live and UOPs on Blu-ray discs, thus letting you copy any Blu-ray to hard drive or any blank Blu-ray disc. It also supports to copy 3D Blu-ray. DVDFab Blu-ray Copy makes perfect 1:1 ratio clone, allowing you to copy BD-50 to BD-50 and BD-25 to BD25. Compressing BD-50 to BD-25 and DVD-9 to DVD-5 are also available. During the copy process, HD audio could be retained, removed or converted to Dolby AC-3, DTS-HD audio to DTS for saving space. This Blu-ray backup software also supports multi-core CPUs and the newest NVIDIA CUDA, ensuring a fast copy speed. Open "Copy" option and then click "Add" button to import source BD50 disc after you insert BD50 disc into the Blu-ray recorder drive. Choose subtitle and audio track, set Volume Label, choose "BD25 1080p/i" under "Output", click "Advanced Settings" if neccessary. At the bottom left corner, set target output directory in the "Save to" box. You could choose another blank BD recorder drive (if you get 2 Blu-ray recorder drives and have already inserted a blank writable BD25 disc into the drive), or computer hard drive. After settings, click the bottom right corner "Start" to start copying BD50 to BD25. DVDFab Blu-ray Copy also allows you to shrink BD50 disc to BD25 ISO image file and then transfer the BD25 ISO image file onto a blank writable BD25 disc if you only have one Blu-ray recorder drive on your computer. DVDFab Blu-ray Copy is not able to shrink protected BD50 discs. Note: Make sure you are not breaking the local law while trying to shrink BD50 to BD25. This post is not trying to encourage you breaking laws for copying Blu-ray discs, but only providing solutions for shrinking Blu-ray discs you’ve purchased.